1. Choose File. Make control.ocx (control is the name of the custom control) to create the control’s OCX file. Replace contro/.ocx with the name of the OCX file you want to reoister. 3. Close the DOSPrompt window. You’re ready to use the new control in any project even Web pages. In the Visual Basic IDE, the name of the custom control will appear in the Components dialog box (choose Project Components to open this dialog box). The same name will also appear in Front- Page’sActiveX Control Properties dialog box. You should be able to see the Alarm control counting down on the page. Of course, nothing will happen when the alarm times out because you haven’t added any code to the page yet. 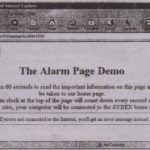 The script should start the timer as soon as the page is downloaded and when the alarm times out it must take the viewer to another page (the Sybex home page to be exact). in the onLoad event’s handler. The AlarmT1U\eproperty can’t be set at design time so it must be set from within the page’s script. When the Alarm control times out the Alarm_Time Out event is triggered. In this event’s handler we must program the browser to jump to another page with the Window.Navigate method. on this page and then you’ll be taken to our home page. 3. 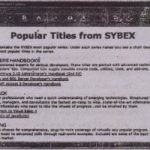 Wait for 60 seconds, and the script will load the Sybex home page. If these controls are used en a page to collect data from viewers, there will also be a Submit button on the Form. Use the button’s onClick event to make sure the requir d fields have values before submitting the data to the server. 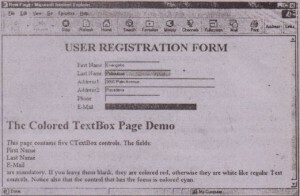 On the CD, you’ll also find the LABEL3D.HTM page, which uses the FLXLabel custom control of Chapter 16 to display carved and raised text on the browser’s window. To test the LABEL3D control on a Web pilgC you must first register the control with your sy tern and then replace the control’s CLASSID attribute in the page with the. 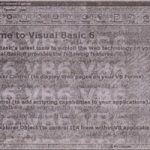 value that Visual Basic will generate on your system.